On 10th November the Slovenians are called to elect the President of their Republic. Although affairs are undertaken by the government in this Balkan Republic the President does not have any less power. The President is elected by universal suffrage for a non renewable five year mandate and is the commander in chief of the armed forces. He proclaims laws, appoints top civil servants, appoints and calls back Ambassadors and decides on the pardons to be granted. Although the National Assembly cannot hold session, the President can take decisions on a state of war, emergency and the use of the armed forces. He does however have to submit his decisions for ratification by the National Assembly as soon as they are allowed to meet again. Slovenia is a former communist block country and is also a model State. Its economy is healthy, the GDP per inhabitant is now three quarters of the average GDP in the European Union and represents a figure comparable to that of Greece or Portugal. Growth is stable and strong (3% in 2001), there is plenty of direct foreign investment (this tripled in 2001 in comparison with the previous year), most of the old structures have been privatised and exports are increasing - trade and budget deficits are limited even though the level of public spending remains high. The slackness of the economy in 2002 has however led to an increase in the inflation rate that was already high in the first quarter of the year (7.6%) and investments have slowed. In terms of foreign policy the country's integration into the European Union and NATO comprises the main priority of the entire political community. The number of Slovenians in favour of membership in both cases has however dropped over the last few years. The rise of euro-scepticism is especially significant amongst the agricultural communities (last February 85% of farmers said they would vote against their country's entry into the EU if there was a referendum). But it is the integration into NATO more than that of Europe that is the source of most controversy today. Five years ago 61.3% of Slovenians said they were in favour of their country joining the North Atlantic Treaty. In the Autumn of 2001 this figure had dropped below the 50% mark (49.7%) decreasing further over the last few months (44.6% in February 2002). According to the polls those opposed to NATO are politically close to the Social Democrat Party of Slovenia (SDSS) and the social democrat coalition (ZLSD). Slovenia has a Parliament comprising two houses. The National Assembly has 90 members, elected every four years (the Italian and Hungarian minorities are guaranteed a seat each by the Constitution). The second house, the National Council, is elected every five years and comprises 40 members: representatives of the local organisations, economic interest groups, social, professional and trade associations. Since the last general elections on 15th October 2000 Slovenia has been ruled by a coalition of the Liberal Democrat Party, (LDS), the Slovenian Popular Party (SLS/SKD) and the Democratic Party of Slovenian Pensioners (DeSUS). The Prime Minister is Janez Drnovsek (LDS) who, apart from a six month period in 2000, has occupied this position since independence in 1991. 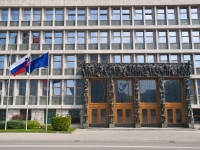 The Liberal Party of Slovenia (LDS) won by a wide majority in the last general election with 36.3% of the vote against 15.8% on the part of its main rival, the Social Democrat Party of Slovenia (SDSS). The next elections of the members of the National Assembly will take place in 2004. Just one month before the election Janez Drnovsek appears to be the favourite in the Presidential Election. However the Prime Minister will probably not be able to win in one round and will have confront France Arhar in the second round of the election.